This is one of those days I thought a microwave might have been nice to bake the potatoes in, but I survived! Aside from the time involved the soup is pretty basic and the final product is rich and decadent. This a perfect dish for those vegetarian friends that say they could never give up cheese. It’s proof that they don’t have to give up the flavor! Ahh...the shorter days means its harder to get natural light for us working mamas. And just when my pictures had started getting better! In a soup pot saute onion, celery and garlic in olive oil over medium low heat until onions are translucent. Add flour and cook for five more minutes. Slowly stir in vegetable broth and water. Bring to a boil and then simmer for 30 minutes. While broth is simmering mix together nutritional yeast through turmeric in a separate bowl. After broth has simmered for 30 minutes, pour into a blender and blend on high until smooth and creamy. It took a minute or so in the Vita-mix. Pour 1/2 broth back into soup pot. Add 2/3 to 3/4 (depending on how chunky you want soup-I used 2/3) of mashed potatoes into blender with remaining broth and blend until creamy. Pour mixture into soup pot as well as remaining mashed potatoes. Stir in cashew cream. Ladle into individual serving bowls. Sprinkle vegan cheese of choice on top. Bake for 25 minutes. After removing from oven add condiments like sour cream and fake bacon bits and serve. 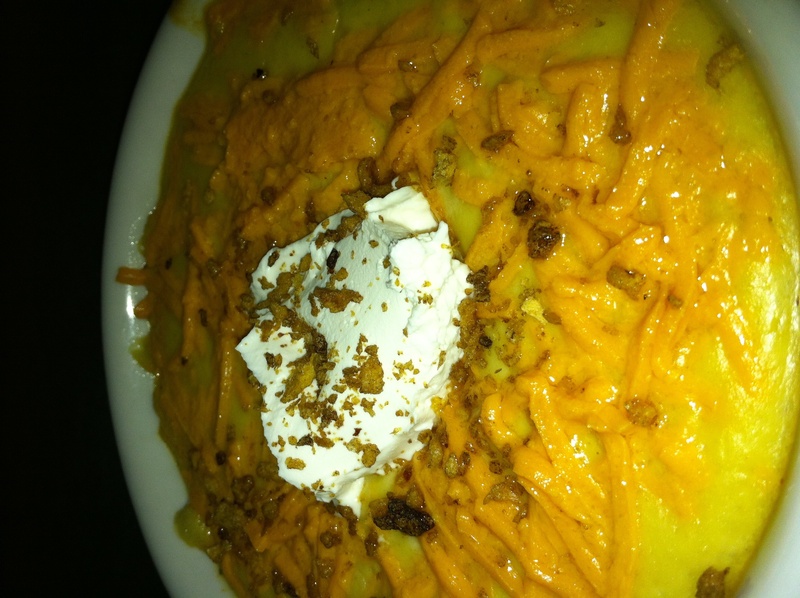 Gallery | This entry was posted in soup and tagged cashew cream, cheesy, decadent, potato, vegan. Bookmark the permalink. My sister has been begging me for a cheesy potato soup, so this is almost perfect! Do you think there is something else I could sub for the cashew cream? She’s allergic, boo! You could use a vegan sour cream or a grain/hemp milk. The soup prior to adding the cashew cream was pretty creamy so you may be okay not adding anything.